Complete newbie, Have searched for an answer, not found one. Curve to be approx 1" Radius. What gizmo do I need to get ? Where should I look to learn about it? I'm guessing a dividing head table, but asking as I don't know. In future, I want to be able to cut gears too. I'm using a Seig 2.7 mill. 1) I'm lazy and fairly inept, so that's a non starter. You didn't say in what plane you want the radius. as you only want a 1" radius a small one will do, but might be restrictive for future jobs. I have 4" and 6" and use the 4" most, but anything you can do on a 4" you can do on a 6". However I'm not sure how a 6" fits on your milling machine, others will advise. You probably would not go wrong with a 4" rotary table from ArcEurotrade. If there is a hole at the centre of the radius, all you need is a pin in the hole and rotate the job in a vice. (see Youtube video). What is the material and how thick is it? If you're abilities are not enough to file a workpiece into a curve I wonder at how you would go about setting up to mill the workpiece. I'm not being rude but practical, as any apprentice will attest, you're expected to learn bench work first before being thrown near a 5 axis CNC machine. And a motorised table is kind of in that territory, you cant just bolt a lump.of metal to it, press a button and out pops the finished item. As with most things there is a hell of a lot more to do. And the idea that machining a piece would be simpler and quicker is false, sometimes setting up takes a lot more work than actually doing the job. Plus you can always apply Occams Razor, the principal that the simplest solution is usually the right one. For me, a one off curve would be easiest done on a vertical belt machine or abrasive disc. By the time you have done setting up your mill and rotary table I would have shaped the piece, had a cuppa, painted it and gone in for lunch. Rather than buying a rotary table before you are certain which one you want (I made that mistake and haven't actually needed to use mine yet as for many jobs a file is quicker), you might be able to make filing it easier. After spending hundreds on machines, it was quite disheartening to realise that hand tools can be less work. Perhaps take off most of the metal with a couple of angled cuts, either on the mill or more easily with a hacksaw (where you don't have to do mulitple set-ups or worse still reset a rotating vice to straight) and then file it between a couple of steel buttons. If you can't harden them put layout fluid or Sharpie on them and try not to file it off. If there is a hole, bolt them through (which would let you use cheap ballraces as buttons) otherwise clamp them. EDIT: If you do go down the motorised table route, take a look at Arduino Rotary Table for Dummies on HMEM. The whole project costs less (much less if you use an Arduino clone) than a set of division disks for a rotary table, and assembling the electronics was a fun introduction to Arduinos. I might even get around to fitting it to my rotary table one day should I need it... (EDIT2: If I can find it that is, I have a horrible feeling I nicked all the components for other projects, Arduinos are seriously addictive). For a low cost solution, if your vice sits on swivel base, you could hold the piece in the vice, offset from the centre of the vice by the required radius. Mill a flat over the end of the component. move the vice around a few degrees and make another pass. You could do that for 180 degrees of rotation of the vice. Now turn the component upside down and repeat (if you can't achieve full depth on the first passes). EDIT: If you do go down the motorised table route, take a look at Arduino Rotary Table for Dummies on HMEM. The whole project costs less (much less if you use an Arduino clone) than a set of division disks for a rotary table, and assembling the electronics was a fun introduction to Arduinos. FWIW, I use a HV6 Rotary Table, with Division Plates, to cut gears. So far, seemingly, with success. 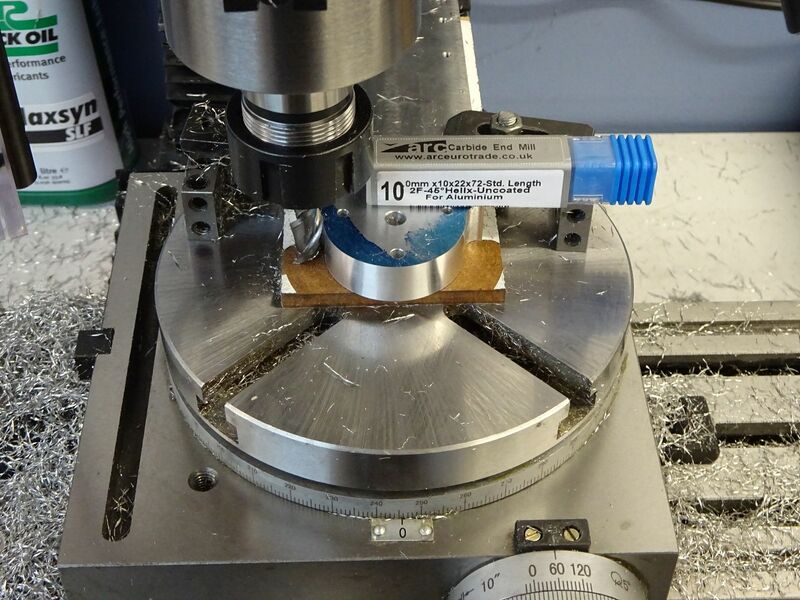 When you are milling your radius; a) make sure that the work is clamped securely b) Do NOT "climb" mill. The work must approach the cutter blades, head on, (from the opposite direction). Without backlash correction, climb milling is likely to pull the work into the cutter with possible ruin for both. Variation of advice already offered by others. 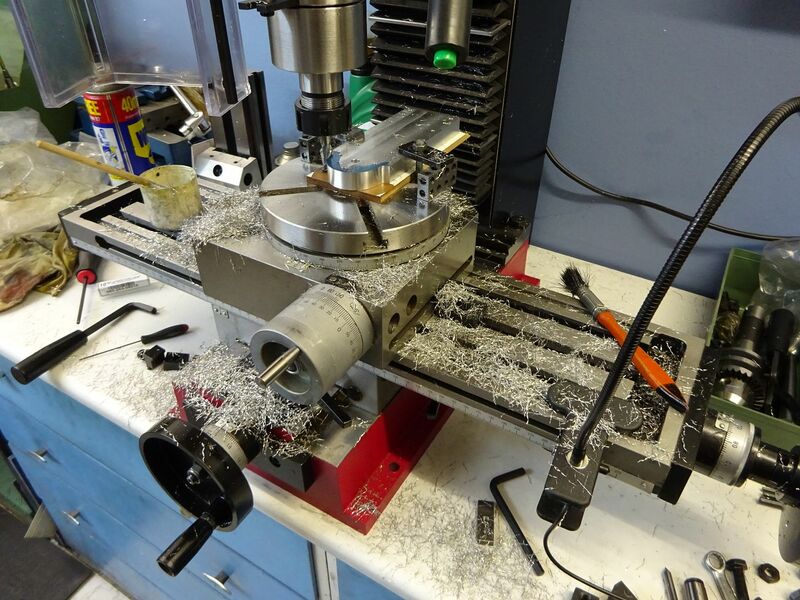 Make a pillar that can be clamped into the mill's vice, tapped to allow a carrier and/or workpiece to be rotated against the side of a milling cutter. Take care - the thick washer in the photo was damaged by a grab. Beware of fingers - take it gently, don't climb mill or use large diameter cutters that might allow a small job to be pulled inside the helix. Not tried it myself, but a more elaborate version of the pillar fitted with length of hacksaw blade bent in a circle, can be used to index a gear-wheel. Nice thing about owning a mill and a lathe is you can make things to make things. I often make jigs or fixtures to hold or support work during awkward cutting operations. For example, this aluminium block was made to put a filleted half-flat on a long brass pin. A lot of the import DROs will allow cutting a radius by providing a series of x and y coordinates for points on the circle. I suppose one could use the bolt circle function on most DROs if a huge number of holes were specified. Of course, it would be necessary to compensate for tool radius. That method may not work for longer parts. If you want a useful tool too, you could make a face plate balancing spindle. Then use it with a long leaver as a rotary table. Gents, I'm profoundly grateful for the advice, thank you all. Through some budding bodgineering (which is what I aspire to) and using hints and tips from this thread, I've kind of got close to what I was after. The "nail it to the table, and spin it round" advice kind of covers most of the equipment I currently have. Do I want to file? No, that's why I bought a belt sander. I went with the "Pin through a hole and rotate in the vice" method, Sadly, a long (ish) piece of work and a low vice meant I managed very little of the curve that way, but enough to get a "feel" for the shape, 5 minutes on the belt sander and, from a distance, with yer glasses off, in low light, it kind of, looks ok. I'm discovering that "machining" is probably best done by fairly accurate sawing, finished off by machining the bits the saw can't do and providing a surface texture. An hour spent cleaning (that's new to me too, I'm sure I'll get faster) and the garage has a shiny, uncompleted "bit" in it, a clean shiny mill, and a happy bunny who is now waiting for more "essential tools" to arrive. In the meantime, I can pick the swarf out of my socks . . . Thanks again, I shall be asking more questions as I blunder along the learning curve. Edited to remove oil rig language.